I'm not a HK Fanboy, but do appreciate some of the older HK designs. I've owned several P7's and carried them for about 10 years- excellent pistols. I thought the P9s was cool, but parts are nil and time passed that one by. The VP70 was super cool for when it came out, but had the worst trigger in history. 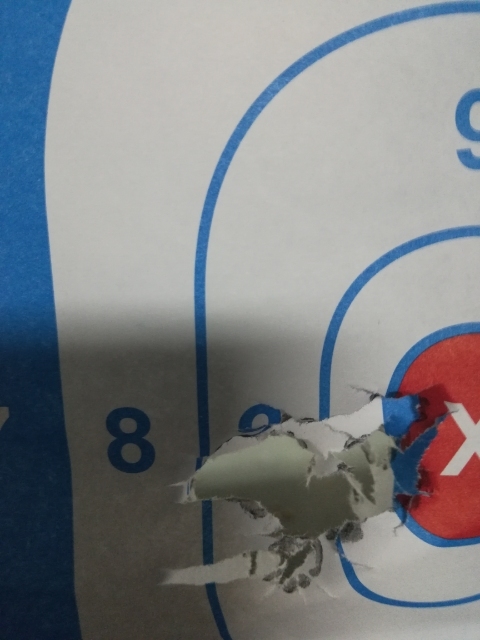 HK4 .380 was so-so. USP 45's , including the tactical have never been my cup of tea and I don't shoot them well after several attempts to get my groups tighter. I shoot 1911's better for accuracy and more comfortable with Glocks for polymer. I love the MP5 /HK94 and HK91 and still have those. So that's my frame of reference. 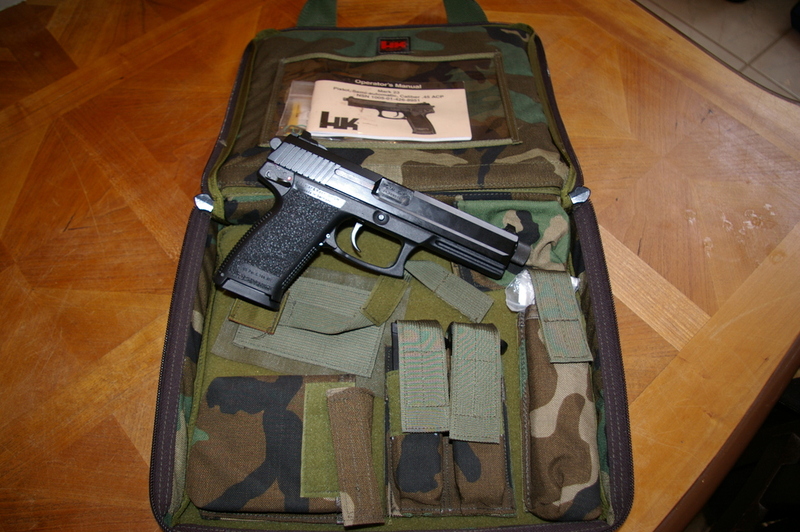 I recently was able to try a HK Mark 23 after these years of seeing them in the Gander Mountain display case. this one an an older one with the marine finish. There's jokes about them being crew serviced weapons and other gems about the size. It had a 6" barrel so it will handle like a long slide 1911, but thicker and possible a bit lighter. There's better choices for daily carry so there's nothing to stop anyone who owns one of these from getting a 45 M&P or G21 and appreciate the Mark 25 for a unique piece that it is. So in my case, I have match 1911's that are more accurate and smaller pistols to CCW and I don't have to pick one over another. That being said, my takeaway on the Mark23 is that it's a great, fun pistol to shoot. I think it's acceptable in accuracy and I'm picky. At least as good as some of the good 1911's out there. I shoot Les Baers about the same. Reliability has been excellent. The targets below are 25' offhand in SA. 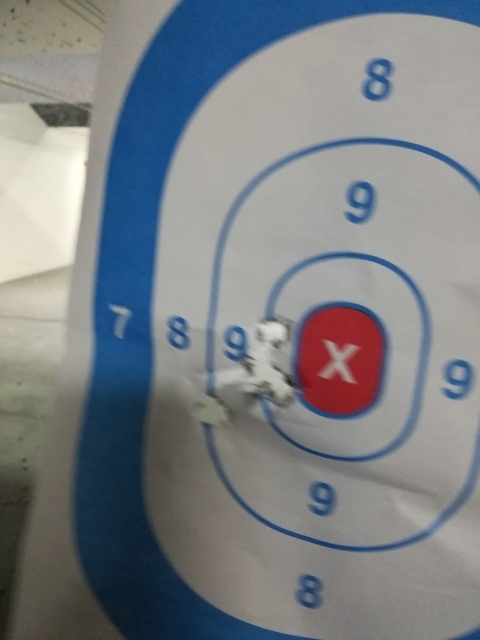 My poor trigger control pulls the groups to the left. But this shoots at least as good as a Les Baer of other custom 1911. I think the main point that separates the Mark23 is that the internal parts are super overbuilt. The recoil spring is the thickness of your thumb. The internal metal levers all appear to be machined and not stampings. The CHF polygonal bbl is heavy and chrome plated. Frame and rails are thick and overbuilt. So it's a beast of a gun, suited for lots and lots of rounds at the range and that's what this pistol is for. There's several pistols that can probably do things better in a smaller package and comparisons are often made to the FN tactical 45 or the USP Tactical 45. From a practical sense, that may be the case but from a historical sense, the Mark 23 package is unique and has no peer. i'll agree, the 23 is a great gun. I've never had one but a friend of mine got one when they first came out and used it a lot, which meant I got to use it a lot ! As you said, it is just way too big for any somewhat "normal" use but outside of that it is an accurate and reliable gun. To the best of my knowlwdge he has never had any trouble with it and has put thousands of rounds through it. Regarding your P9, I had one in .45 and liked it, but any time anything went wrong with it it seemed like it was down for a month or two trying to get parts and such. But it was a great looking gun and shot like a dream.